The Arch2Arc Challenge 2012 – London to Paris on foot, by rowing boat and by bicycle in four days. The dust on my successful Bob Graham Round has scarcely settled and thoughts of the Paddy Buckley or Ramsay’s Round swirl around my head, but I must turn my attention from running to something more alien: rowing. In August I am rowing the English Channel. Not on my own, I hasten to add. I am rowing with a team of four (and a cox) from Dover to Calais, avoiding ships, sewage and whatever else may cross our path. It is meant to take seven hours. All this is part of a greater scheme: to travel from Marble Arch in Central London to the Arc de Triomphe in Paris. 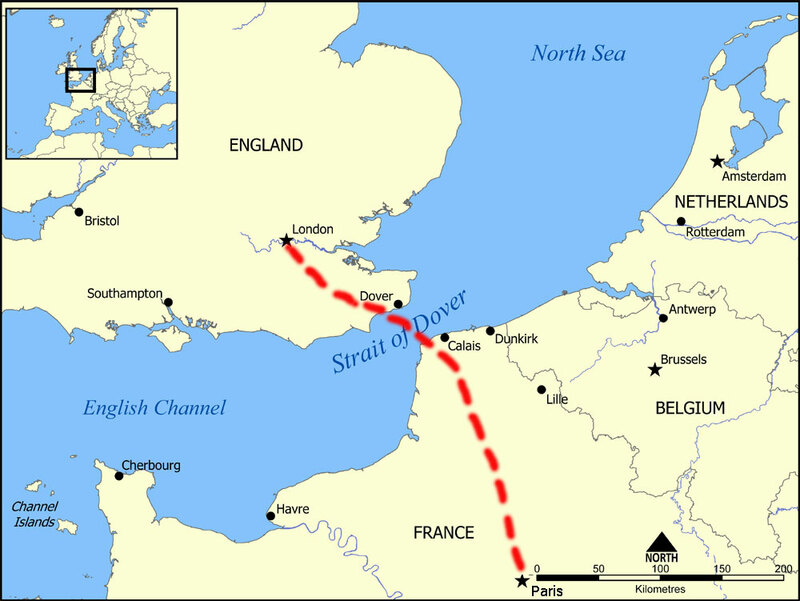 We will relay run some 80 miles from London to Dover, jump into a boat to row the Channel, then cycle the 180-or-so miles to Paris over two days. Our challenge is therefore dubbed Arch2Arc. Oddly – with less than three months to go – our team, Tom Levitt, Will Surman, Nick Yates and I, have yet to be in a room together, let alone a boat. 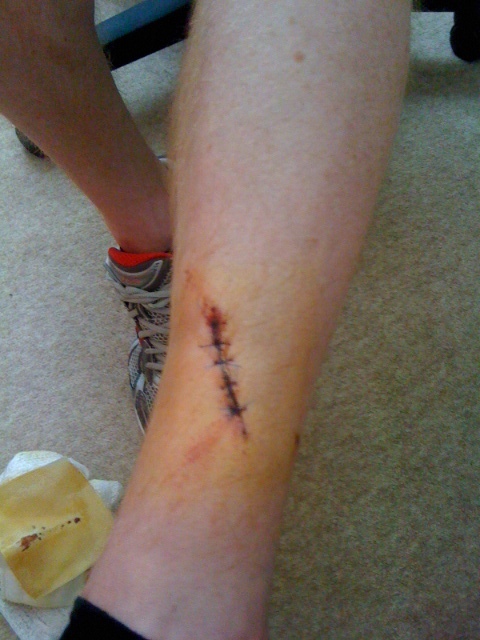 Just to complicate matters further, Tom yesterday – while riding at around 20mph – took a tumble in Richmond Park. He was untouched by car or cycle; the road was dry and straight. It seemed he leaned to the left to loosen a shoe, only to career off the road, flip upside down and embed his shin bone into something very sharp and pointy. He was carted off to St George’s in Tooting, with Nick and I following by bike. The unfortunate consequences are below. The running and cycling part of Arch2Arc don’t worry me, although Tom’s fall was a reminder of my own mortality when pedalling; it’s the watery bit in the middle that makes me nervous. Apart from a mile or two rowing down the River Thames in an origanoe last year, I haven’t rowed any major distance since I was part of a group of six who journeyed down an 80-mile stretch of the River Wye. A four-hour course of sea rowing from Hayling Island next weekend will hopefully, go some way to allaying my fears. Blind faith suggests I’ll get through this, and seeing as blind faith is all I have at the moment, it is going to have to do. Still, it could be worse; at least I have two functioning shins. Previous Post Bob Graham Round – SUCCESS! Next Post Bob Graham blues?